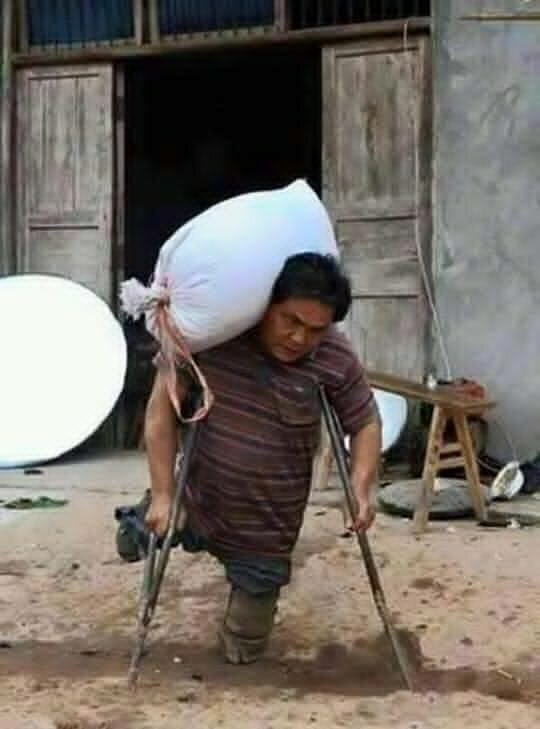 Nations Press feature Despite Having No Legs,This Hardworking Dad Lifts Heavy Sacks To Earn Money for His 4 Kids! Despite Having No Legs,This Hardworking Dad Lifts Heavy Sacks To Earn Money for His 4 Kids! This man is a role model to every one that despite being in that situation, he is eager to provide the needs of his family in a decent way. Parents would do anything and everything for their kids to live a good life even if they have to sacrifice everything, even their health. What we could only hope is for the kids to appreciate their parents’ efforts and find a way to pay them back by doing well in school and later finding a job so that their parents can rest and be able to enjoy the rest of their lives. On Facebook page, Music for Jesus, a dedicated dad was featured because of his extra dedication for his kids. According to the post, this man works hard to earn a decent living even if he does not have legs for as long as he can feed his 4 children! We pray that you will always have good health and that your kids will grow up well so they can support you. We hope that soon you won’t have to carry heavy sacks to make a living but that the local government from wherever you are (wasn’t mentioned in the Facebook post) will provide you with a capital to start a business or to give you a job that won’t require you to lift heavy stuff!